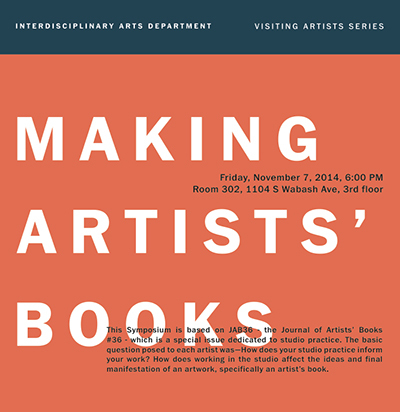 Friday, November 7, 2014, 6:00 p.m.
How does your studio practice inform your work? 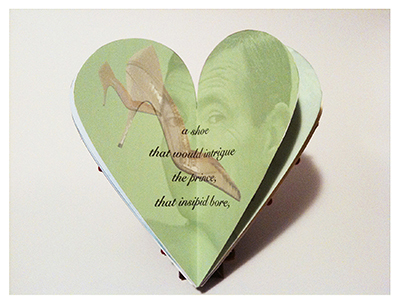 How does working in the studio affect the ideas and final manifestation of an artwork, specifically an artist’s book? The Symposium will feature three of the artists who participated in JAB36: Philip Zimmermann, Miriam Schaer, and Brad Freeman. Philip Zimmermann is an artist and a professor at the School of Art at the University of Arizona. Although working in various media, his preferred form is the photo bookwork, which he has been making since 1975. He publishes his and others’ work under the Spaceheater Editions imprint. Zimmermann’s work is in many private and public collections internationally. Miriam Schaer’s work has been in numerous exhibitions including the Museum of Art and Design in NY. She is a NYFA Artists Fellow and her work is included in the Brooklyn Museum’s Sackler Center’s Feminist Art Base. She is the Acting Director and a Lecturer in the Interdisciplinary Book and Paper MFA Program at Columbia College Chicago. 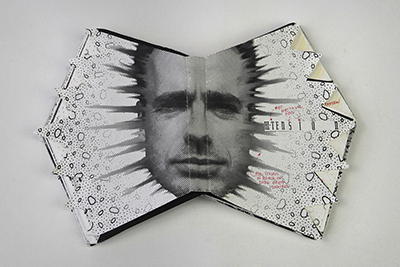 Brad Freeman is an artist and offset printer who has been making artist’s books since 1980. He founded JAB, the Journal of Artists’ Books in 1994 in an attempt to raise the level of critical inquiry in the field. JAB has been produced at the Center for Book and Paper Arts, Columbia College Chicago ,where Freeman has worked since 2007.